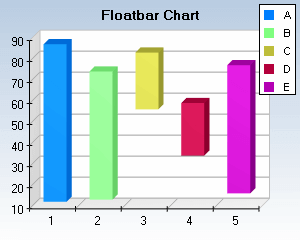 The 3DChart component can display float bar charts. The style of the bars can be one of the following: Bar, Cylinder, Cone, Inverted Cone, Pyramid, Inverted Pyramid, Smooth Edge Bar or Cut Edge Bar. The width of the bars can also be controlled. By default the float bar charts are displayed vertically. Variations include changing the style of the bars as well as modifying the width of the bars and the applied projection. The user can easily display horizontal float bar charts, which require some minor changes in the applied projection and the text orientation of the axes.